As this dismal summer silly season winds down, savor The Trip to Spain as the perfect palate cleanser. That’s the primeval, knee-jerk reaction direct from the human core to the conclusion of this third installment in Steve Coogan and Rob Brydon’s Trip saga. The ending is on par with John Wick: Chapter 2. In this case, it’s a particularly unexpected what-the-heck-happens-next finale, the kind that ultimately proves how endearing the three Trip movies are. Steve Coogan and Rob Brydon — their mix of real and fictional personas — have become kindred spirits during the travels and to leave things dangling like this is, to impersonate Sean Connery in Indiana Jones and the Last Crusade, “Intolerable!” After all, the previous two movies, The Trip (featuring northern England) and The Trip to Italy, were self-contained movies. At the end, they both go home to the standard domestic life. The ending here is perfect fodder for a conversation on par with their typical dinnertime banter. 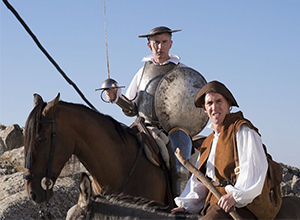 And in keeping with the topic-hopping, impersonation-heavy verbal jousting between Coogan and Brydon, it is absolutely fair game to compare the conclusion of The Trip to Spain to John Wick: Chapter 2, regardless of the fact they are in virtually every other respect movies of polar opposites. It’s kinda sorta similar to how, in The Trip to Italy, Coogan and Brydon jump from chatter about The Italian Job (1969) to The Dark Knight, all thanks to Michael Caine. Kinda. Sorta. Let’s not belabor the point around the conclusion, shall we? Let’s get into what this trip’s all about and simply look forward to the next one (and, exactly like how there better be a John Wick: Chapter 3, there better be a fourth Trip). As with the other two excursions, the catalyst is the opportunity to be food critics. This time, Coogan will write for The New York Times while Brydon will be The Observer’s foreign food correspondent. Admittedly, neither one of them knows much about food, which is only one of the many reasons why the Trip movies are so entertaining. For Coogan, he’s taking things one step closer to personal with this trip. The itinerary is a recreation of a trip he took following the completion of his A-levels. He was 18 and he found himself in the romantic clutches of a 37-year-old woman. And he’s also inspired to document the trip in a fashion like Laurie Lee’s As I Walked Out One Midsummer Morning. Of course, Brydon asks the obvious. Now that Coogan’s 51, is he still interested in pursuing a woman 20 years his senior (heavy emphasis on “senior”)? And neither are particularly interested in ruminating on their age. Fittingly, it’s noted Cervantes wrote Don Quixote when he was in his 50s and at 37 he married a woman nearly half his age. For that matter, Mick Jagger is still having children at the age of 73. Coogan and Brydon are in their prime right now. It’s easy to enjoy the repartee between Coogan and Brydon. Particularly on this trip, Brydon’s wit seems to break down Coogan’s defenses and he has no choice but to laugh. But beyond the humor, there are doses of fictionalized drama that provide depth and an interesting blend of fact and fiction, of fantasy and reality. The drama involves their personal lives and romantic entanglements as well as their professional lives and artistic ambitions. This time around, Coogan is confounded by a studio’s demand his screenplay be doctored up by an “up and comer.” Coogan’s already up and arrived. Why the heck is an up and comer necessary? To that end, Coogan is caught fantasizing about winning the Oscar for Philomena (a movie he produced, wrote and starred in alongside Dame Judi Dench). The winner was another Steve, McQueen, for 12 Years a Slave. Along the way, they encounter a group of buskers and invite the young lead performer to a pint. He offers all sorts of travel advice; he’s got the casual backpacker vibe going on and he’s got loads of suggestions for food to try and sights to see. But Coogan’s on a mission and he’s got a set itinerary that includes a fixed date to meet up with his 20-year-old son at a set location. It’s a funny exchange about food and culture that further proves how life is not one size fits all and neither is travel.